Luke and Emma's engagement was spectacular and so memorable! A snowy day in the desert in Utah does not come along very often. 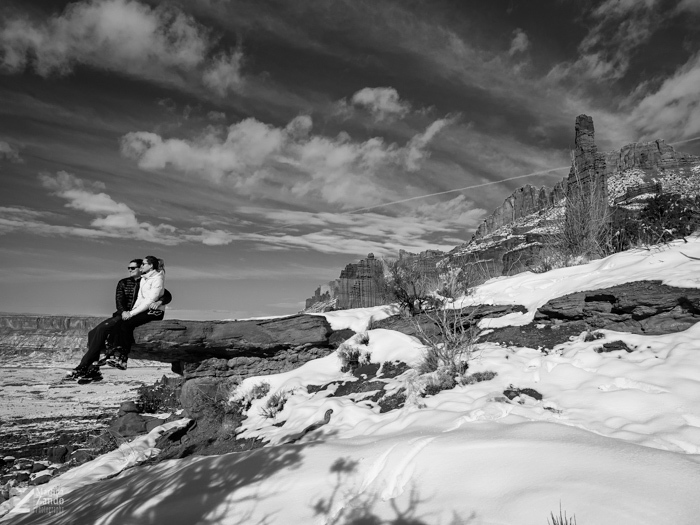 The Fisher towers are majestic every day, but with the snow they are even more stunning. Just two or three other people ventured out that morning. The path was untouched and Luke and Emma were making fresh steps in to the powder. After skirting under the Titan, Luke reached a promontory overlooking Castleton Tower and Castle Valley. The view was magnificent, the perfect place to propose. The rest is history, almost! Emma received a stunning custom made ring from the UK based HK Jewelry and said yes! I kept to a lifestyle shoot, which avoided any posing and captured the natural moments as they happened. Congratulations to Luke and Emma! All photos Martina Zando Photography, Las Vegas based Portrait, Lifestyle and Boudoir Photographer. Older PostDon’t make the same mistakes as me!